La Judee Depuis le Retour de la Captivite, et particulierement sous Herode Le Grand et ses Enfans. 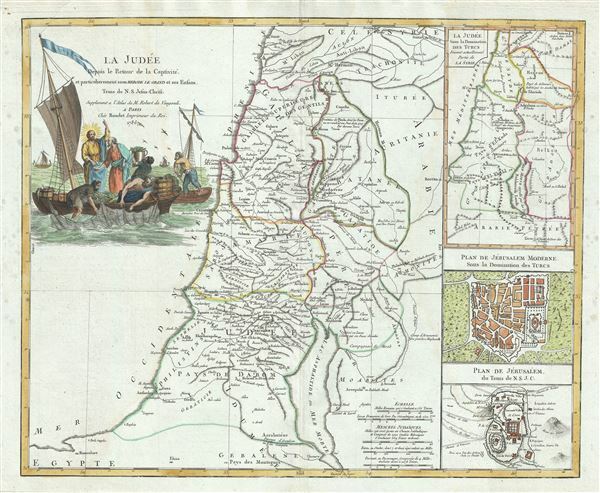 This is a scarce 1786 map of Israel, Palestine or the Holy Land by Robert de Vaugondy. It covers from the ancient city of Sidon in modern day Lebanon south as far as Rinocolure and Raphia (Gaza). Includes the modern day countries of Israel, Lebanon and Jordan. The map includes three insets along the right border. These feature Judea under the Turks, Plan of Jerusalem under the dominion of the Turks and Jerusalem during the time of Jesus Christ. Throughout the map notes important towns, cities, rivers, ruins, mountains and other topographical features. A beautiful and elaborate illustration depicting Jesus with the fishermen appears in the top left quadrant along with the title. This map was drawn by Robert de Vaugondy and published in the 1757 issue of his Atlas Universal. Very good. Minor wear along original centerfold. Original platemark visible. Some spotting and offsetting with water stains covering a large portion of the map.